TAMPA, Fla. - Jan. 25, 2019 - PRLog -- Manager Sam Raabe of Brandon Honda recently honored the dealership's top 21 sales and service associates for 2018 in several categories that are aligned with its operational goals for the year. These standout employees all contributed greatly to being named American Honda's top dealership in Tampa's district 7F, based on 2018 new vehicle sales. "New Car Salesperson of the Year" and "Used Car Salesperson of the Year" were both awarded to Chris Irvin, who outsold everyone else in both new and used cars. "Internet Salesperson of the Year" went to Chris Weiss for selling 172 units. "Executive Manager of the Year" was awarded for the second year to Tim Jamil for excelling in new and used car deals, while taking a personal interest in his customers' and colleagues' needs. "Top Customer Service Experience (CSE) of the Year" went to Taje Blake, who scored an outstanding 94.4% CSE on 111 customer surveys. "Rookie Salesperson of the Year" went to Nik Truong for quickly adapting to the job and bountiful ambition. "Top CSI Salesperson of the Year" went to Mohamed Duhayat, who had a near-perfect Customer Service Index rating of 99% from 56 customer surveys great year in sales. "Sales Administrator of the Year" went to Carol Manning for the second consecutive year, for being an energetic, multi-talented associate who excels in all that she does. "Assistant Service Manager (ASM) of the Year" was awarded to Jennifer Chasse, for achieving outstanding service and exhibiting team leadership for operations consistency and volume. "Parts Employee of the Year" was Anthony Bongiorno, based on total parts sales and taking outstanding care of customers. "Technician of the Year" was awarded to Joel Bjornstad for the third consecutive year for his extensive Honda service knowledge and 18 years of experience. "Express Technician of the Year" was awarded to Ruben Ojeda for 997 hours of consistently high quality work and high sales volume. "Detailer of the Year" was awarded to Jebediah Ryan, for the second consecutive year for billing 300 hours and for going above and beyond to satisfy customers. "Service Administrator of the Year" went to Glenda DeValle, who is a dependable team player who's always willing to help others. "Fixed Operations Manager of the Year" was awarded to Eric Lewis, who is truly amazing as the service operations director at both Brandon Honda and Sun Toyota, overseeing service, parts and collision operations. "Financial Services Manager of the Year" was awarded to Chris Shotwell for delivering 4,623 units since he began the job in 2013 and being by far the best all-around team player at Brandon Honda. "Most Inspirational Employee of the Year" was awarded to Justin Jarrell for the second consecutive year in helping to mentor and coach new sales associates in every aspect of their jobs. "Most Improved Employee of the Year" went to Jerry Meany, our Assistant Used Car Director for taking on a big new role with a lot of moving parts and being willing to do whatever it took to learn and grow. "Employee with the Best Attitude" went to Mark Landry in service who always has a smile for others and has built amazing rapport with his customers and colleagues. "Outstanding Employee of the Year" was awarded to Luis Anglero for jumping into his new job quickly and working so well with everyone at the dealership. "Outstanding Manager of the Year" went to Service Manager Rachel Christie who came up through the ranks and has excelled in every position because she's a resilient leader focused on growth. "We congratulate our standout employees for yet another year of excellence and achievement," said General Manager Sam Raabe. "It's hard to stand out here at Brandon Honda and earn these recognitions, as we are all competitive and strive to be the best we can be every day." The hallmark of a Morgan Auto Group www.morganautogroup.com dealership is its keen focus on impeccable customer service and engagement. Brandon Honda has the area's largest inventory of new Honda automobiles and is located at 9209 E. Adamo Drive in Tampa, FL 33619. It is open seven days a week and features a gourmet café for customer convenience. 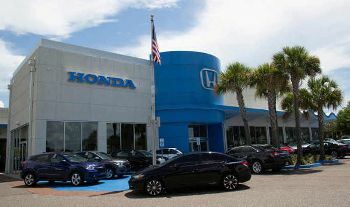 For dealership hours or more information, call 813-664-1234 or visit www.BrandonHonda.com.